Mike Smithson over at Political Betting is looking at how emailgate might alter a Labour leadership contest. 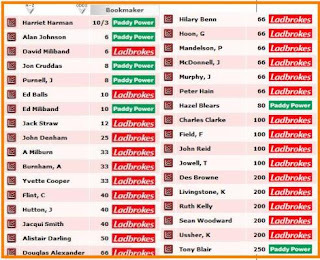 Lobbydog put his money on Alan Johnson a while back, but Smithson says he and Ed Balls may be the losers. Meanwhile Jon Cruddas is the one to watch. Why is Harman the front runner? How can anyone believe she would be good?